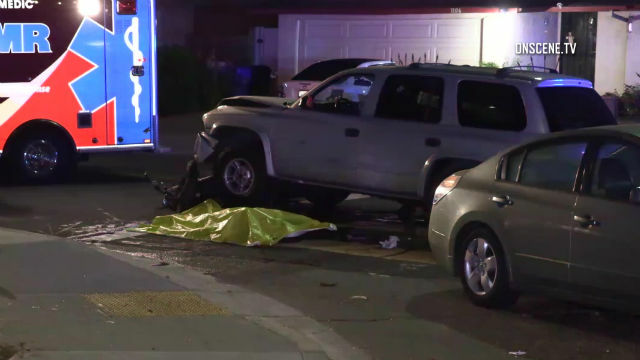 A 24-year-old man was killed when he was struck by a suspected drunk driver and thrown from his motorcycle into the windshield of a third vehicle at an Egger Highlands intersection in the South Bay, police said Wednesday. Officers arrested a 29-year-old man driving a Dodge Durango SUV who they say caused the crash about 7:10 p.m. Tuesday at Coronado and Thermal avenues near Mar Vista Academy, San Diego Police Officer John Buttle said. The motorcyclist and Durango were both on Coronado Avenue approaching Thermal Avenue from opposite directions when the Durango attempted to turn left and struck the oncoming motorcycle, Buttle said. The rider was thrown into the windshield of a Nissan Altima that was northbound on Thermal Avenue. Sheriff’s deputies from nearby Imperial Beach were the first emergency responders to arrive at the scene and began performing CPR on the badly injured motorcyclist, Lt. Steve Behrendt told reporters. Paramedics and firefighters took over the emergency medical aid, but the rider died at the scene. The name of the victim was being withheld until his family could be notified and police did not immediately release the name of the Durango’s driver, who was arrested on suspicion of driving under the influence of alcohol.